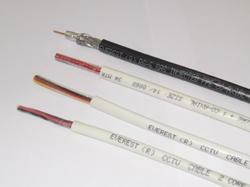 We offer a qualitative assortment of CCTV Cables that are manufactured using premium grades of raw material. These cables are widely used in connecting the CCTV Surveillance Cameras to the VCR, DVR or PC Based DVR System in an easy way. The clients can choose their choice either from Bulk-Style CCTV Power & Video Cables or Pre-Made Power/Video Cables as per their specific requirements. Our range of Pre-Made CCTV Camera Power and Video Cables are widely accredited for easy installation. Looking for CCTV Cables ?